Arthur Buck, R.E.M. 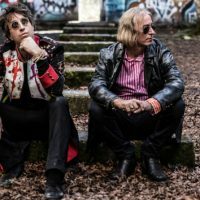 guitarist Peter Buck‘s new project with indie-rock singer-songwriter Joseph Arthur, has lined up its first tour. The 12-date trek gets underway September 7 at Seattle’s Crocodile club and is mapped out through a September 24 show in Minneapolis. Tickets will go on sale to the public starting this Friday, May 18. Pre-sale tickets to select concerts also will be available; visit ArthurBuckMusic.com for more information. Arthur Buck’s touring band will include Young Fresh Fellows singer/guitarist and former R.E.M. sideman Scott McCaughey and drummer Linda Pitmon, both of whom also play with Peter in The Minus 5 and The Baseball Project. As previously reported, Arthur Buck’s self-titled debut album will be released on June 15. The two musicians have known each other since Arthur opened for R.E.M. in 2004. They decided to collaborate after a chance encounter in Mexico near the end of last year. Arthur produced the 11-track collection, which you can pre-order now at NewWestRecords.com. One of the songs from the album, “Forever Waiting,” debuted today on Billboard.com. The duo previously released a video for another track, “Are You Electrified?,” that you can view on New West Records’ official YouTube channel.